GrandCamp Adventures is a company dedicated to delivering toys and activities that help kids have fun and strengthen their relationship with their family members...especially grandparents! The products are beautiful and would make great kids' holiday gift items whether for a toddler, adventure seeker, or bookworm! If there is a bookworm in your home, this book is sure please! Here We Go! Around the World Family Adventure StoryBook is a beautifully illustrated book for any child who enjoys an adventurous and magical bedtime story. The book is about a set of adventure seeking grandparents and grandkids who, with the assistance of papa’s magical compass, circle the world to recover their lost treasures. Along the way, children Savannah, Luca, Aidan and their “Pa-Parents” get to know more about each other and the world around them. They discover faraway lands and traditions, breach castle walls, survive a brush with quicksand and meet a stowaway meerkat. My eight-year-old son found this book very captivating. He loved the fact that the “Magic Compass” helped the characters find their missing treasures all across the globe! Here We Go! 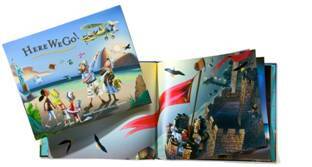 Storybook is perfect for ages 7+ and is available for $18.95. Secret handshakes have become a popular way to show that you are a member of a group. Great times are in store as you create your own Grandparent/Grandchild secret handshake with the guidance of 24 handshake cards. Turn the cards over and solve the floor puzzle picture from the Here We Go! Storybook Adventure. Enjoy these fun games at home, on vacation, or anytime you've got a few minutes for GrandCamping. Ahoy Matey! Hear pirates singing in their search for treasure or join in with a “mob” of Meerkats in a chorus all about family with original music, along with a few classics from GrandCamp Adventures. These songs bring everyone to their feet from blues to bluegrass to reggae and even a lullaby, the CD features 10 songs, including 8 originals that cover a broad spectrum of musical genre sure to appeal to both young and old. My son and I listened to this CD and found ourselves holding hands and dancing around the room! We particularly liked, “We’re a Meerkat Family,” “Backwards Day” and “Love and Happiness for You.” What makes this CD even more special are songs specifically for children and their grandparents to enjoy together. These include, “Nobody Loves Me Like My Grandma,” “Old Granddad” and “Nobody Loves Me Like My Grandma” sung as a lullaby. 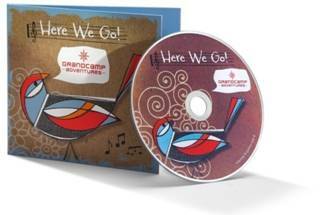 Here We Go is available at local retailers, iTunes and www.GrandCamp.com for $12.00. Don’t just buy any cuddly stuffed animal! Begin your cuddly stuffed animal collection with the entire Meerkat family—perfect for the animal lover. 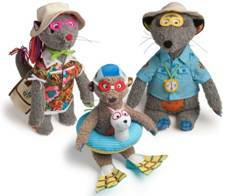 A great reminder of the fun adventures you’ve been on as well as traveling companions for adventures yet to come, these high quality plush animals make the perfect gift for grandparents to give their grandchildren. The only plush animal line created just for grandparents and grandkids, these high quality characters are sure to become a part of your family. Buy them all together for greater savings and then give them one at a time or all at once. Available at $49.00 and up. What’s not to love about a treasure hunt? 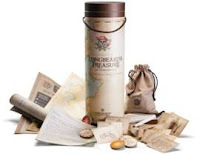 The Longbeard’s Treasure Hunt activity features a note from a colorful pirate character as well as treasure maps, clues, coins and special action cards. Explore how the adventure evolves in a way that will have kids and adults scrambling from clue to clue to find hidden treasures. Available for $54.99. Note: Thanks to GrandCamp Adventures for providing sample products. Cara Potapshyn Meyers and MotherhoodLater.com assume no liability relative to products reviewed in this blog.